The government gives the money to mortgage servicing companies, to encourage them to modify the loans. Whose lame brain idea was that. Oh let me see, all those Corporate types that the President kept himself fully surrounded by. And with small staffs of entry-level workers, they could only turn a profit if they never need to perform any customer service. Handling millions of individual requests for relief simply overwhelmed them. Furthermore, servicers make their money from a percentage of unpaid principal balance on a loan. Forgiving principal — the most successful type of loan modification — eats into servicer profits, so they shy away from that, opting for less effective interest rate cuts. Plus, servicers collect structured fees — such as late fees — which make it profitable to keep a borrower delinquent. 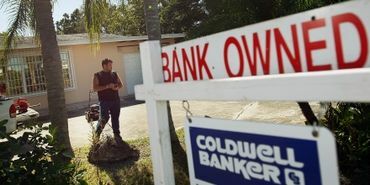 Even foreclosures don’t hurt a servicer, because they make back their portion of fees in a foreclosure sale before the investors for whom they service the loan. The modest incentive payments in HAMP were no match for the contrary financial incentives toward foreclosure, rather than modifying loans. Never are there any advocates for The We The People that come up with these so called "deals" and if this was thought through, anyone with half a brain would of known this was going to fail. But the banks, well in there case it was a simple one page document.......hand over the money, bail them out. A friend of mine got into one of these disaster loans and lost her home, she got help from a program set up to right some wrongs that was done to the people. You know what she got? $350.00 That is correct, I've do have the point in the correct spot......Three HUNDRED fifty dollars.....that is it......that is all she got for being raked over the coals, scammed, and put there the emotional wringer. Face it people, we ALL got screwed. Hardly any of us has escaped being screwed over, and perhaps from several directions, between our homes, our jobs, the now ongoing low wages, our kids can't launch, our children are in debt for life from student loans, our retirement accounts were robbed, our savings gone, our social security is frozen and we are told over and over again we need to live on less, but the Wealthy are doing well so as most in DC are wealthy.........hey, what's the problem or the rush. As the Occupiers chanted......Banks Got Bailed Out - We Got Sold Out........over and over again. And little if anything has changed. Dandelion stated it very well in her comment. It was also clear to me when Obama appointed the Bankster-advisers early in his admin. that we would be sold out. In fact, my jaw dropped that day; was shocked and angry. And, things went downhill from there for those not in the 1%. That's why I joined local Occupy protests. I am now concerned that this is so entrenched it will be difficult to change. But, the pendulum can't remain stuck forever. We have got to vote in a Congress and Pres. who will make significant changes in a positive direction for the 99%. Dandelion, you did sum this up very well. As you point out, just about everyone was affected by the financial meltdown of 2008 in one way or another, often in many ways. Thank you for sharing that horror story about your friend who ended up with a $350.00 compensation after being ripped off by a program that was supposed to help. It's really frightening that we are at the mercy of a bunch of crooks, essentially. Lois, I remember having the same kind of reaction that you did upon finding out that Obama had appointed people like Timothy Geithner and Larry Summers as part of his administration. I knew immediately that we were screwed. I wondered why on earth he would do that. What a colossal disappointment! It's true that everything is cyclic, but the stronghold of the Big Banks seems to be more ironclad than ever. Things may well get worse before they get any better, and it may be a long time. Just think of how much better off our economy and poorest citizens would be today, If only the $800 BILLION or MORE given to the bankers (1%ers) who stashed it ALL, was instead distributed to poorer struggling families? All that money would have been spent, on necessities, homes, vehicles, appliances, things that would help lift so many FROM poverty, back into the economy. Instead, the richest 1% got it all, and they hoarded it along with their other many millions. Sad, but I think that if ever TPTB give money to actually provide real help for the working poor, TPTB will then immediately turn on the presses and give themselves 100 times more. What I mean is, by the time a poor person gets $50k, the average price of a home will be $1,000,000. Ex. Zimbabwee a few years past. I would hate to see it happen, but it probably would be better if the U.S. went the way of South America, where if you want to purchase real estate, you have to have the cash to do so. Bye bye predatory lenders for sure. Also--agree with Dandelion, you and Lois.